Collectable card games (CCGs), also called trading card games (TCGs) or custom card games (CCGs), are played using specially designed sets of cards. CCGs combine the appeal of collecting with strategic game play. Specific game cards are most often produced in various degrees of scarcity, generally denoted as common (C), uncommon (U), and rare (R). The Ace Card Company has the infrastructure to create the collectable card games for you. Starter packs and booster packs can be created as per requirements. 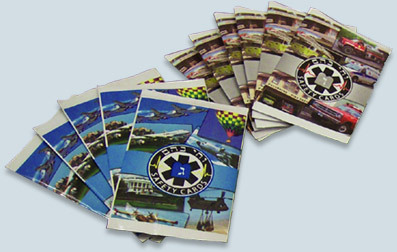 Other requirements like play mats, play sheets, posters, game booklets or game pads and instruction sheets/booklets can be incorporated into the game boxes as per requirements. A booster pack is a sealed package of cards, designed to add to a player's collection. Booster packs generally contain a relatively small number of cards randomly assorted. Booster packs are the smaller, cheaper counterparts of starter packs. Booster cards shall be packed into foil wraps. If quantity is a constraint then we can also pack the booster cards into low spine tuck boxes specially created for the 10 card to 20 card packs. 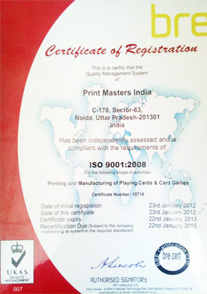 All collectable card games are printed on C.P.C. 5 color KBA RAPIDA 105 printing machines. You can always use our FTP service for uploading your digital files. We accept files of Adobe Illustrator, Adobe Photoshop, Freehand, Quark Express and Page Maker files. Files of both platforms of MAC and PC are acceptable. The minimum quantities for collectable card games start at 2160 decks. Again, customized tuck boxes are printed per specifications. Booster packs can be packed into foil wraps if required. We request you to scroll through some samples shown on these pages. All card games and game cards shown on these pages are the sole property of the clients. We have only printed the card games to required specifications. We do not sell these games. These are just examples of a few products manufactured at our plant for our customers across the world. Here are a few samples of games that we made from the concept stage and for as low a quantity as 2160 units. Again, you will also find games that were manufactured in quantities as large as a million decks.